At PiOT Services our Occupational Therapists provide a variety of assessments which identify and help determine recommendations to enhance the quality of life for seniors. After the assessment an easy-to understand written report is provided that documents the recommendations to aid the seniors, their caregivers and families. This report can also be very valuable to medical professionals in the community, enabling them to better support the seniors. Wherever your loved one calls home – in their house, condo, apartment, or at their vacation property such as a cottage or trailer – one of our experienced Occupational Therapists can provide an “in home” assessment in the language of their choice. If your loved one lives in an adult life style/retirement residence, long-term care or nursing home facility, one of our Occupational Therapists can assess them there as well. In addition to speaking English, our team speaks twelve other languages including French and Spanish, Cantonese and Mandarin, Bisaya and Tagalog, Punjabi, Hindi and Urdu, as well as Kannada, Malayalam and Tamil. For additional languages, our Occupational Therapists have been assisted by trusted family members who have translated the questions and answers. When necessary, qualified translators are used at an additional cost. If more than one type of assessment is required, we will have the same Occupational Therapist do it, as with time there is a familiarity and like you, we want our seniors to be comfortable. This assessment will take an overall look at the individual’s ability to function in all areas of their life in their environment. It will assess their strengths and difficulties in areas such as their physical functions, sensory abilities, cognitive skills, and social functioning. This will present a better understanding of what needs to be done to improve and support the individual in order to be safe and independent, and to best manage their daily life activities at home. Your OT will assess your home environment to identify barriers that may be limiting safety, function, and accessibility in their home. We will then make appropriate recommendations regarding the need for equipment, assistive devices, home modifications, assistance of a personal support worker or other services, as well as making suggestions for lifestyle changes to keep the individual aging safely and comfortably at home. This assessment can be further investigated with the assistance of an Occupational Therapist in the delivery of occupational therapy treatments. Assessment of an individual’s home environment is necessary to identify environmental and structural barriers that may be limiting safety, function and accessibility, resulting in a higher falls risks. Occupational Therapists are skilled in identifying these barriers and making recommendations to improve safety, accessibility and function within the home by determining the need for assistive devices and/or home modifications. Further interventions will assist with putting these recommendations in place to create a safer home environment, giving peace of mind to seniors, their caregivers and families. Being part of the community is an important part of any individual’s life. Whether it includes using public transit, grocery shopping, going to groups or attending programs, or walking their dog, we want to enable seniors to safely continue their involvement. An assessment of community safety would take into account each individual’s unique lifestyle and tasks to ensure they are able to engage in these meaningful activities in the community. The assessment would identify the specific activities in which the individual would like to participate, and identify the difficulties preventing their full engagement in their community activities. Your OT will develop ways for you to overcome any barriers or learn new skills to assist with engagement in the chosen activity. Activities of Daily Living (ADL) are the essential activities an individual performs on a regular basis, including activities such as eating, bathing, grooming, toileting, dressing, walking, transferring and continence. Instrumental Activities of Daily Living (IADL) are meaningful activities you do such as cooking, cleaning, driving, and working, rest and sleep, education, leisure and social participation. An assessment of the ability to perform the ADLs and IADLs includes a detailed geriatric assessment performed in the home to take a closer look at how the you performs your day-to-day tasks and identify the difficulties preventing their full engagement in these activities. Together with you and your family, your Occupational Therapist will identify any limitations and suggest services that will support safety and independence while performing day to day activities. We are trained to provide strategies and equipment for task modification to allow seniors to continue to take part in their meaningful activities. This assessment involves a detailed look at an individual’s cognitive function i.e. memory, attention, processing speed, insight/judgment, executive function and planning skills, etc. The Occupational Therapist will use a variety of tests and observations to evaluate the individual’s cognitive abilities, using standardized and non-standardized tests to determine areas of strengths and limitations. We will provide them with opportunities to learn about the types of supports available that would help keep the senior safe and independent. The results can also be used to develop a treatment program that includes cognitive remediation and/or compensatory strategies to improve function in their everyday life. Your Occupational Therapist will screen for any possible signs of cognitive decline, common to seniors population. These screening tests will be used to identify the need for further cognitive assessments, as well as to allow your OT to make recommendations for treatment. We can also assist by speaking to your doctor family doctor about the test results in order to continue with further psychogeriatric evaluations, or to suggest further referrals to medical specialists. Your Occupational Therapist will conduct a variety of physical assessments to determine the individual’s level of strength, balance, and endurance. Recommendations for appropriate mobility devices and therapeutic programs to improve strength, posture, endurance and mobility may be suggested. This, in turn, will assist in lowering the risk for falls and improve safety. Recommendations may also be made for further services that may help to improve performance in these areas. Impairments in visual perceptual skills may lead to the person falling more often, performing daily tasks more slowly, or having difficulty with reading, taking their medication properly, eating, negotiating stairs (going up and down stairs with and without a railing), and other essential daily activities. This assessment will evaluate the senior’s visual perceptual skills and determine how any limitations result in them being unsafe or limit their independence to function. Further treatment may be recommended, such as changes in lighting, changes around their home environment to assist with vision, etc. This assessment is conducted if an individual is having difficulty with mobility and may benefit from a mobility aid, such as a walker, wheelchair, scooter or other device. The Assistive Devices Program (ADP) is a program operated by the Ontario Ministry of Health and Long-term Care which provides funding to Ontario residents who have long-term physical disabilities that require the use of a mobility aid. At PiOT, many of our Occupational Therapists are registered as “authorizers for seating and mobility assessment” with ADP, allowing them to determine an individual’s eligibility for the program. Your OT will complete the assessment and if the individual is found to be eligible, the therapist will complete the application for funding and submit it to the ADP program. The assessment evaluates the individual’s condition to determine if they would benefit from a mobility device and determines which mobility device(s) best meet the individual’s needs. An ADP funding application is then completed and sent to the Ministry of Health to apply for funding for 75% of the cost of the device. Your OT can also assist in applying to other sources for additional funding, where available. Further treatment can be provided to assist the individual to work with an equipment vendor of their choice to order and receive the mobility devices they require. 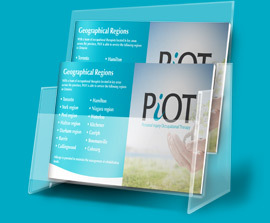 Learn about PiOT’s treatment and consultation programs for seniors.